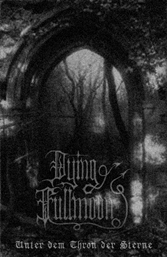 Dying Fullmoon was a German band hailing from Lower Saxony, existing for only brief period in the mid-90s. Of the demos that were released during this time, 1995's Unter dem Thron der Sterne that really stands out as the better of the two. This tape offers the sort of raw Black Metal that would make most modern bands cry themselves to sleep, knowing that they could never hope to match the pure ferocity and darkness found here. Unfortunately, Dying Fullmoon ceased to exist in the winter of 95/96, fading back into the shadows of the Teutoburg Forest. Though eleven tracks comprise this demo, only four or five can be considered proper songs. Over twenty minutes of the material is made up of various instrumentals, as well as a couple classical pieces. Most of the synth pieces fit, adding sort of a gloomy horror feeling, but the same cannot be said of the latter. The main issue with the two parts of the 'symphonie' is the clarity of sound, which is quite a contrast to the rest of the tracks. The sound quality is very lo-fi and is rather similar to that of the old Moonblood reheasals and demos. That said, the actual songwriting is more straight-forward and lacks the epic nature of those tapes. There are a couple sections in "Der Tod Des Zweifelspiegels" that utilize clean guitar and some spoken word bits in the background, creating somewhat of an unsettling feeling. It is done in a way to darken the song, rather than to 'pretty' it up as a lot of bands end up doing. The bulk of the material consists of cold tremolo melodies that hearken back to Under A Funeral Moon and Transilvanian Hunger. The harshness of the riffs is accentuated by the razor-thin guitar tone. Furthermore, they are played in such a frenzied manner that one cannot help but feel the sense of urgency that they convey. This differs strikingly from the flat and lifeless way in which much Black Metal is presented, these days. All of this is accomplished by a mere duo, seemingly, playing through these songs live in their rehearsal space. It may be that while one played the drums, the other contributed guitar and voice. There does not seem to be any bass at all, nor a secondary guitar track. Astaroth's tormented screams are similar to the throat-shredded vocals that Hat performed on Gorgoroth's A Sorcery Written in Blood. This does well to add to the grim and obscure atmosphere, as well as the occasional slower sections that are worked in. It is rather difficult, but if pressed to choose a favourite track, it would have to be "Bosheit Inmitten Der Stahlfelsen-Festung". This is the one that caught my attention and turned me onto Dying Fullmoon, and it is dripping with intensity and rawness. Really, this could be said of nearly any proper song on Unter dem Thron der Sterne. If you like stripped-down, primitive Black Metal in the vein of early Darkthrone and Mütiilation, definitely seek this out and give it a listen.